Heat therapy is an important method for pain relief used in Ayurveda and Kalari Chikitsa. The therapeutic use of heat increases blood flow to the affected area which promotes healing. It relieves pain, decreases muscle spasm, relaxes muscle tension and can increase range of motion. The heat opens up the pores and rids the body of toxins through the sweat, allowing the body to heal faster. While every form of Swedana can provide relief from pain and stiffness and remove toxins, the most effective method will be chosen depending on your condition. Swedana can be done through the application of heat (sagni sweda) or even without the application of heat (niragni sweda). The materials used can be applied dry (ruksha sweda) or wet (snigdha sweda). The area of application can be local (ekanga sweda) or the full body (sarvanga sweda). 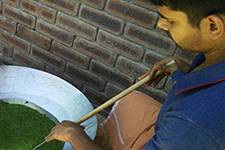 At Kalari Ayurveda Centre, Swedana is administered in the form of steam or through heated topical applications of herbal oils, powders, pastes or poultices. This treatment consists of applying steam evenly to the body while sitting comfortably in a wooden steam box. With this method, the body can be fully steamed while the head remains cool. In Ayurveda, it is believed that the eyes and head should be protected from overheating. A dam of dough (made of black gram flour) is placed on the affected area and is then filled with warm herbalised oil. The pores of the skin are opened due to the warmth allowing the healing properties of the herbs to more deeply penetrate the affected tissues. Ayurvedic and Kalari massages create heat in the body through warming massage movements. The body is also heated from the warmth of the oil, and the warming action of the herbs in the oil. 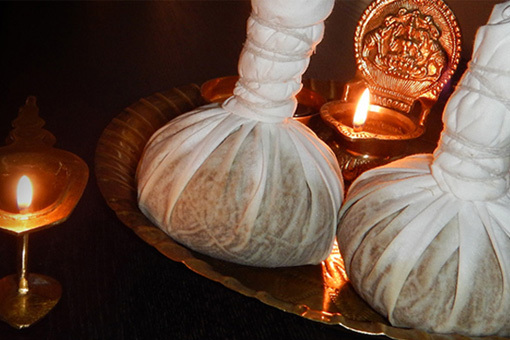 A Kizhi is a poultice that is densely packed with herbal ingredients. The Kizhi is dipped in heated herbal oil throughout the treatment and massaged over the affected area or whole body, as required. The heated oil activates the herbs within the Kizhi allowing the healing properties to be absorbed through the skin. Udvartana is a treatment in Ayurveda in which specially prepared herbal paste or herbal powder is massaged over the body. The brisk massage techniques, combined with the penetrating herbs, creates heat in the body. Heat is applied via a warm herbal paste which is thickly applied over the affected area. Herbal leaves are placed over the paste and then bandaged with cotton cloth. It is retained on the area for at least six hours. Swedana without the direct application of heat (niragni sveda) is also recognised, such as exercise. Kalaripayattu is a method of swedana through exercise (vyaayaama).